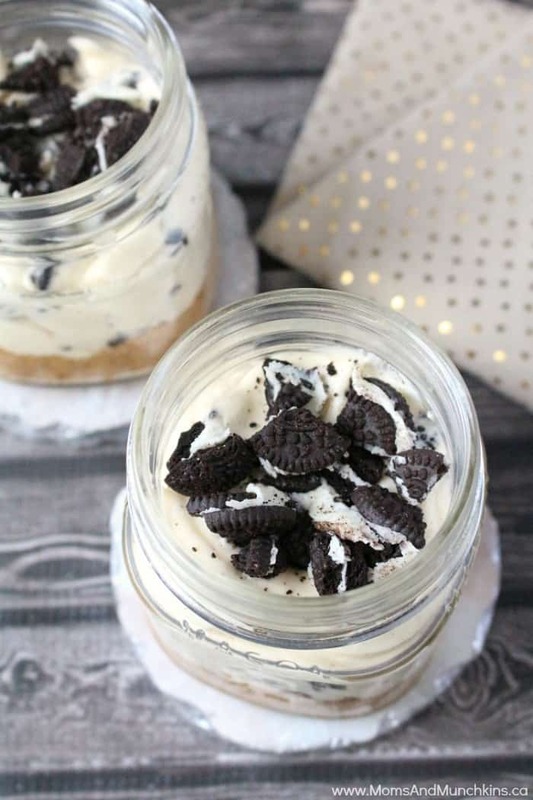 This delicious No Bake Mini Cheesecake In a Jar is a perfect party dessert! No bake means you have more time to prepare everything else for your party…including more time to taste test all those delicious desserts! Here I’ll provide the recipe for the Cookies ‘n Cream version although there are many ways to mix this up a bit for different flavors. Below the recipe I’ll provide some ideas for alternatives. 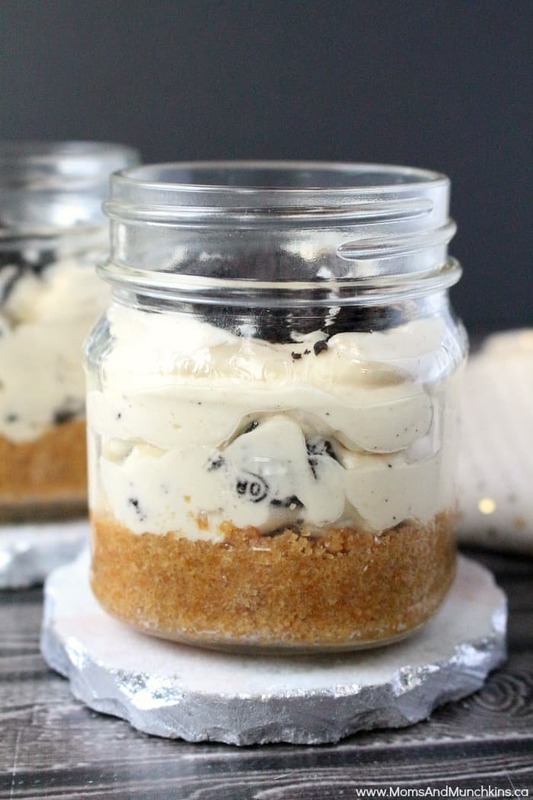 This No Bake Mini Cheesecake is a perfect party dessert! 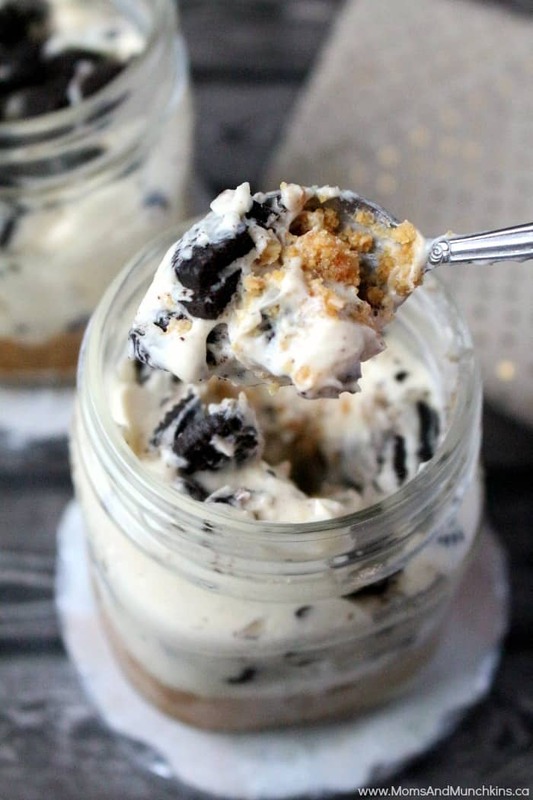 You can substitute the cookies for fruit, crushed chocolate bars or any other type of cheesecake filling you'd like. Mix graham cracker crumbs, melted butter and ¼ cup sugar together in a bowl. Press ¼ of the graham cracker mixture into the bottom of each jar. In a large bowl, beat cream cheese, whipped topping, ⅔ cup sugar and vanilla until smooth and fluffy. Add crushed cookies (save 4 cookies for toppings) and beat until well mixed. Spoon ¼ of the cream cheese mixture into each jar. Top each with one crushed cookie. Seal jars with lids and refrigerate until serving time. Swap the vanilla extract with almond extract and add 1/2 cup sweetened shredded coconut. Instead of graham cracker crumbs, use crushed chocolate wafer cookies for a chocolate crust. Use sliced fruit like strawberries or raspberries along with a chopped chocolate bar. Toffee chips, mini chocolate chips and chopped pecans can be used along with a caramel ice cream topping for a “Turtle” flavor. What is your favorite type of cheesecake? Never miss a delicious update by following along on Facebook, Twitter, Pinterest and Instagram. We also have a special Recipes page full of other delicious ideas.